Guys, I'm looking to set up my '73 California with some hard luggage over the Winter ready for some serious Continental touring next year (major lifetime event, 'official' pensioner) . 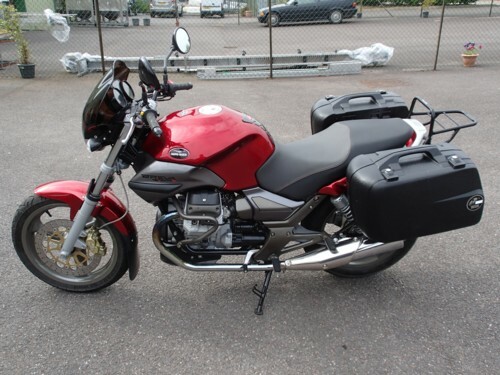 I had my eye on some of the original Guzzi panniers but they are proving elusive so far. So I'm now looking at the Craven range and, in the way the Universe works, I note a suitably equipped steed (Reg #FWX58M) in the post previous to this one (V7 Special heads)! If anyone is so knowledgeably regarding the permutations of carriers/panniers required then I would be most grateful to receive the advice of anyone who has already trodden this road. Currently thinking that 20l capacity (per side) will be sufficient for mature gent and 3 weeks away (mainly camping) from the tribulations of the household. 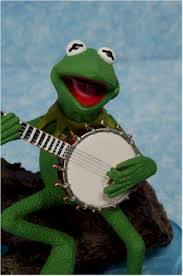 Have emailed the manufacturer but no response yet. Stand upright in a cool place. Those are a pair of second hand Craven Concorde panniers, I bought the panniers, top box and rack for £40 off a customer. 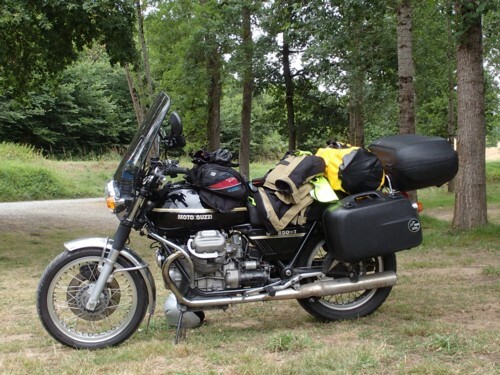 I bolted the panniers directly to the Guzzi pannier frames so they're not quick release but they just hold a hessian "bag for life" what more could you want? S/H Cravens come up for sale regularly on ebay etc. The other two 850GT's in the photo are equipped with Craven racks.Mine,the middle one, had to have the rack widened as the one I had was too narrow. At the time I contacted Draganfly who now own Craven to see if they made the wider rack, they didn't, hence the modification.Fitting Craven gear is a bit like playing with Meccano, the variations in old bike rear ends are readily overcome though you may have to be a bit creative. Mine is the 3rd bike, with white "Police" fairing and as Dave says, it's a Craven rack. The panniers came with the bike but weren't fitted as one had a broken lid. 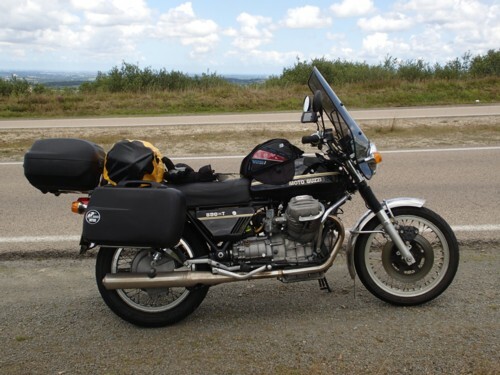 I did see another pair on a BMW once, and eventually tracked the manufacturer down to a small fibreglass firm in Birmingham that once made motorcycle luggage as well as shower trays etc. I think the L-shape brackets that join the rack to the footpeg fixings are home-made and the panniers are bolted on. I have a Rickman topbox too, but don't keep it on the bike all the time. For camping it's more convenient to strap the tent etc directly onto the rack. The Craven option I think probably looks best, being in period for the bike. 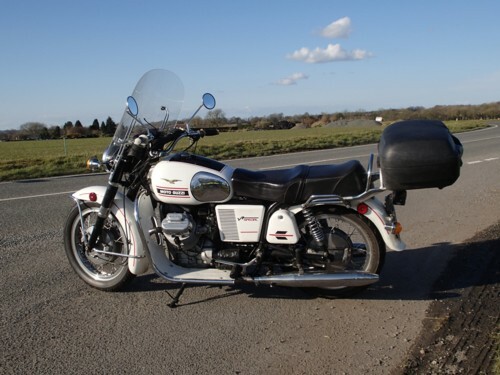 For transferability between bikes, I use Hepco and Becker, good quality gear and it often comes up s/h on ebay etc. This enables quick release fitting to another bike or for cleaning/maintenance. It saves having shed full of different panniers for different bikes. You will need to do a bit of fabrication work rack-wise though. I have yet to adapt a spare set of the pannier rails to fit the V7. But once the frames are sorted, it's very handy to be able to swap them over from bike to bike.